If you’re having email delivery issues on your host, you can connect DAP to 3rd-party email systems like Amazon SES and AuthSMTP. 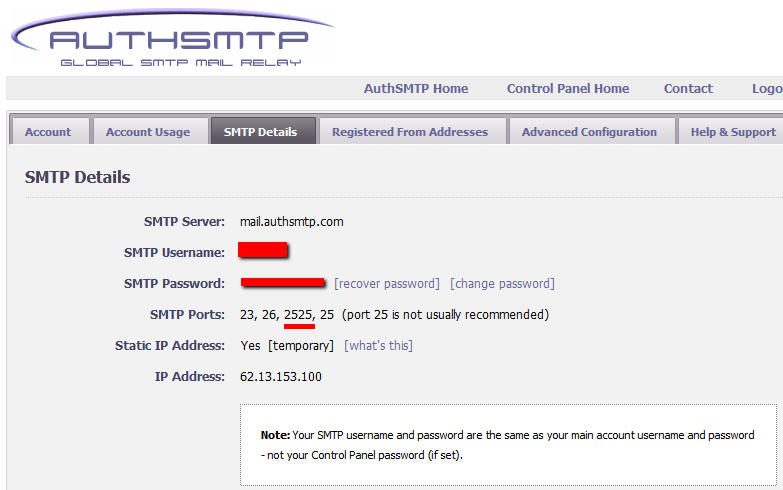 In this article, you’ll see how to integrate DAP with AuthSMTP. Take the email id from DAP Admin > Setup > Config > From-Email Id and enter that email here and register it here (basically, you’re whitelisting your DAP Admin email id as a registered sender – if you don’t do this, AuthSMTP will reject and discard all emails sent via DAP). You will need to “Confirm” the registration by clicking on an activation link that they will be sending you. In your AuthSMTP account, go to SMTP Details tab. Make a note of the SMTP Server (usually mail.authsmtp.com), SMTP Username, SMTP Password. Click on the “Add” button to create and save the new AuthSMTP server setting. And now you should see two rows under Manage Existing SMTP Servers: One for “Local Web Host” and another for “AuthSMTP”. For the “Local Web Host” row, be sure to set “Active” to “N” – because now that you have set up AuthSMTP, you want all instant welcome emails, autoresponder and broadcast emails to be sent out through AuthSMTP, and not your web host’s email server. If you want to speed up your web site, you must address the core issue, which is — your web site is getting more traffic than your web server (web hosting account) can handle. The easiest thing you can do is to revisit all of your plugins that you have enabled and see if you still need all of them. Remember that every single additional plugin running on your site, adds some overhead to (basically, “slows down”) your web site or blog. So use only as few plugins as you absolutely must. With so many cool plugins freely available for WordPress, it is very easy to get carried away, and install tens of plugins, most of them adding very little value, but sometimes causing the most overhead in terms of server resources. So keep only a bare minimum of other plugins (some social plugins are a real pain – making calls to third-party web sites to get their information from). Using a “cache” plugin for speeding up your site is like putting band-aid on a gaping wound. It’s only a temporary fix, and not a real long-term solution, but every bit helps. We recommend WP Super Cache, and be sure to whitelist all of your member pages from getting cached. Make sure you are always using the latest version of WordPress, or at worst, one version behind the very latest and greatest (you definitely want to be sure first that there are no conflicts with other critical plugins that you’re using on your site). Make sure you update all of the plugins and themes you’re using to their individual latest versions (get rid of every single plugin and theme that you’re not using). If you are hosting on a shared (a.k.a “cheap”) web host paying just a few dollars a month for hosting, then your web site is basically competing for server resources (like memory and bandwidth and database access) with possibly tens (or even hundreds) of other web sites on that same server (many may not belong to you, but to others with whom you are sharing the server – and hence the name “shared hosting”). Search for the keywords “digg effect” or “slashdot effect” on Google, and you’ll see how many WordPress sites crash when a link to the site appears among the top results in popular social sites like Digg.com, Reddit.com or Slashdot.com.If your traffic levels have outgrown your server, then the best thing you can do is to upgrade to a bigger server, or get a Virtual Private Server, or even get a dedicated host, depending on your budget. See our recommended web hosts list. You’re seeing the green “Loading… Please Wait” progress bar continuosly running – it never stops and comes back with any data. If this is a new setup, then it’s possible that your web host does not have a library called “JSON” enabled. Just ask them to enable it for your server. It’s rather simple to do, and we’ve never seen a host that won’t do this for their customers. If it’s an old setup, and it was working previously, then your host made some changes that caused the library to stop working. So you still need their help in resolving the issue. Error Message: “There was an error returning data'”. One possibility is that your database or web site is temporarily down, slow, or plain not responding for some reason. So DAP cannot connect to your database, and comes back with this error. Or it could also be the “Progress Bar Never Stops” issue from above. DAP does not store the domain name anywhere in the database. So if you want to move an existing installation to a new domain, the only place where you need to change your domain name in the DAP installation (if you’re moving across domains) is in the dap-config.php file. Moving a DAP installation consists of basically moving the files, and moving the database. Only 2 components. Do an “Export” of just the DAP tables. Select the “SQL” option and select “Save as File”. All DAP database tables start with the text “dap_”. Save this file on your desktop – let’s say you call it “dapexport.sql” (it could also be “dapexport.txt” – does not matter what the exact extension is – .txt or .sql). Log in to your web hosting control panel of your new site, go to “phpMyAdmin”, select your WordPress database, go to the “SQL” tab, open the export file from above (dapexport.sql), copy the contents, paste into the SQL tab and hit “Go”. All dap data from your old site is now on your new site. Copy the database credentials (db name, db username, dp password and db host) from your new blog’s “wp-config.php” to the “dap-config.php” file stored on your desktop. If you’re also changing domain names, then open dap-config.php, and modify SITE_URL_DAP to point to your new domain name. Upload all dap files to your new site (don’t do full installation – just upload the files). Upload the modified dap-config.php file from your desktop to the “dap” folder on your new site. Log in as WP admin, and activate the DAP-WP-LiveLinks plugin. It should give you a warning that DAP is already installed. That’s ok – that’s what we want it to say. That’s it. DAP is now moved over from your old site to your new site. Log into your DAP Dashboard using your old DAP admin login info, and you’re all set. DAP is not an email service (like, say, Aweber). DAP is just a script – a tool – like Microsoft Outlook or Thunderbird – that simply sends out email using your web host’s email server. It is your web host’s mail server that actually sends out the email to the recipient. So once DAP notifies your mail server about a email that is to be sent, it has absolutely no control over what happens next. It’s like when you put an envelope with a letter (regular mail) into the mailbox (post box). It is up to the Postal Service to actually pick up your letter, and deliver to the destination address. Your web host is like the Postal Service. If it doesn’t pick up and deliver the (e)mail, then DAP doesn’t have any say in it. So if the emails that DAP sends out are not getting delivered to your recipients (or landing in the spam/junk folder of the recipient), there could be more than one reason for that. DAP uses your web host’s email servers to send out emails. Here are some ways to improve email deliverability and also avoid your email landing in the recipient’s junk/spam folder. Check with your web host to make sure they have “Reverse DNS” setup and configured correctly for your domain. If not, then this is most likely the cause of emails not getting delivered. Do not use a Gmail or Yahoo or some other web based email as the “From” email id (under DAP Admin > Setup > Config). If you are on a shared host, you may even consider totally by-passing sending emails through your web host, and instead use DAP’s “SMTP” feature to send emails out through an external email system – like Amazon’s SES (Simple Email Service) , Gmail or AuthSMTP.com. If yours is a new site setup, then this is usually because the hourly cron-job has not been setup. Something changed on your host that caused the cron to stop working. There is an error in the job queue, because of which DAP is unable to proceed with the remaining non-error emails. This could have happened if you tried to send out a broadcast to a CSV list, and there was an error in one of the emails from the CSV list. You’re trying to use a third party “SMTP” server to send out the emails, and your server is unable to connect to that server because the authentication settings you’ve configured on “Email > SMTP” are incorrect. Make sure that the hourly cron (dap-cron.php) is still running – you need to look at your web hosting control panel for that. Go to “System > Job Queue” and scroll through any items there, and see if there are any scheduled messages there with the status “Error”. If yes, then click on the “Delete Jobs In Error” link. That will delete any jobs that can’t be processed because of an error in the email id or in the import process. Also be sure to click on “Delete Successful Jobs (till yesterday)” just to clear up old, sent emails. Also go to “System > Logs” and empty the logs. Go to “System > Config” and set “DAP Log Level” to “5”. That will start logging all the details you/we may need for troubleshooting. Wait for the top of the next hour and then re-visit the queue and see if emails are going out. If they still aren’t going out, go back to “System > Logs”, copy paste all text there, and open a new ticket with that info, of course, also giving us more details about the problem, what you have tried, etc, along with your login info for: FTP, WP Admin, DAP Admin, and Web Host Control Panel. If your inexpensive (read as cheap shared web host is hosting a large number of sites on one server, and one of them knowingly sends out spam (or mistakenly gets flagged for spam), that will put the email deliverability of every web site on that server in jeopardy, because your site now shares the same IP address as that of an “alleged” spammer. So your emails get sent to junk/spam folder by Gmail and Yahoo. Or worse, they just totally disappear into the ether. So do you see how quickly you can go over that hourly limit of 300 emails per hour? Once you go over that limit, any emails that are actually sent by you or the scripts running on your site, will not actually result in any kind of error. The mail server will respond by saying that the email(s) has been sent successfully, but in reality, on the backend, it quietly “snuffs out” the email. Which means, it doesn’t go anywhere – just gets sent to a “blackhole”. So you keep thinking that you sent out the email. DAP keeps thinking it has sent out the email. But in reality, the emails never actually get sent. This is the same as you actually putting your letter into the mailbox at the Post Office. But then, imagine this: The postal worker who comes to pick up your mail, quietly goes to the back of the post office and dumps it all into one giant trash can, and destroys all of the mail. So you’re thinking you actually mailed out that important check to pay your utility bill. But the utility company never gets your check, and they slam you with a late fee. 3) DAP + Good web host (cheapest option, but can lead to mixed results – depends on your host). You could always use DAP and external SMTP service provider like Amazon SES, AuthSMTP.com or SMTP.com to send out bulk mail through DAP while totally bypassing your web host’s email system. This is probably the first best option where DAP controls the composition and sending of the email, the 3rd party service controls the deliverability. Next best option is using a service like Aweber or GetResponse. And if you can’t afford even that, then simply use DAP on a good web host. We ourselves use just DAP and LiquidWeb’s email servers to send out emails to all of our users. And DAP also has built-in job queues to schedule outgoing emails while also making sure that you don’t exceed your web host’s hourly email sending limits (dreamhost’s limit is 300 emails/hour, I think). We use multiple SMTP servers from our own other web sites, all combined to be able to send a few thousand emails per hour. But even with a lot of planning, it is easy to go over the hourly limit. 1) It landed in your recipient’s junk/spam folder. Ask them to whitelist or add your email address to their contacts list. 2) You have overshot the limit, so you would have to actually send out the email again. 3) Try to send out broadcasts during a low-traffic time – say like later in the night – when you’re not actively sending out emails, and using up precious email counts from that hourly quota. 1) DAP + Amazon SES: Best option – this is what we use ourselves here at DigitalAccessPass.com and WickedCoolPlugins.com. 2) DAP + ActiveCampaign: If you must sign up for a third-party service for their advance analytics, we highly recommend ActiveCampaign, which is a very robust and popular email service, which we recommend over even, say, Aweber. This #2 option is great if you want advanced email analytics – like click-thru rates or open-rates – that DAP itself doesn’t offer yet. You will still be able to add the subscriber/buyer to both DAP and ActiveCampaign, for eg., and you will have the choice of sending out the emails from either system. This offers more flexibility, but comes at a cost of the services like ActiveCampaign or Aweber. 3) DAP + Your Web Host: Very usable and workable option as long as you are hosting with a decent web host. We often get asked why use Aweber (or other third-party list service) when DAP itself has a built-in Autoresponder system as well as an Email Broadcast system. So here’s a brief overview of when and why it makes sense to use DAP – or ActiveCampaign/Aweber/MailChimp/GetResponse, etc. DAP integrates with Amazon SES (Simple Email Service), which allows you to send out tens of thousands of emails a day using DAP. Which means that it will only cost you pennies to send out a large volume of email via DAP (just $0.10 per 1,000 emails). So imagine the power of DAP and the deliverability of Amazon in one sweet, integrated system! Until quite recently, it used to be that the biggest advantage of using a third-party service like Aweber was their email delivery rate. But with the onslaught of high-powered, high-deliverability but-still-inexpensive services like Amazon SES, the advantage now shifts more towards DAP. Also, when you use a third-party service, like Aweber, and you send out an email and a number of people mark it as spam (incorrectly or not), your account could get shutdown without notice, and you would lose your entire list (unless of course, you have been maniacally exporting the data every few days and storing it on your computer in the form of a CSV file, the chances of which are highly unlikely). But when you use DAP with say, Amazon SES, your “list” is still stored within the DAP database on your web site. So you always own the list, and the data is always going to be there on your web site, even if you stopped using DAP. And if the same spam issue happens with SES, then Amazon will probably shut down your SES account too – but in this case, that’s not a bank-breaker, because you can sign up with a different email provider, like AuthSMTP.com, or SMTP.com, or Mandrill, integrate DAP with this new email service, and resume your emails like nothing ever happened. Obviously, we’re not telling you this as a way to spam people. The point is that nowadays, people who don’t want your messages any more, instead of unsubscribing, will sometimes mark your email as spam. And when stuff hits the fan, that’s when it’s nice to have some options (like DAP + SES), instead of losing your entire list. DAP is not an email service like Aweber or ActiveCampaign. DAP is just a tool – like Outlook or Thunderbird – that simply sends out email using your web host’s email server, but in an automated fashion, of course. If your inexpensive shared web host is hosting a large number of sites on one server, and one of them sends out spam (or mistakenly gets flagged for spam), that will put the email deliverability of every web site on that server, in jeopardy, because your site now shares the same IP address as that of an “alleged” spammer. So your emails could get sent to junk/spam folder by Gmail and Yahoo. Or worse, they just totally disappear into the ether. Some customers won’t get your emails. This won’t happen with Aweber (for the most part). Aweber (and other premier email service providers) have staff on hand just for this purpose. Their core business is about email deliverability. They spend a lot of time, money and resources dealing with regular ISP’s (like AOL and SBC) to make sure their lists – and their reputation – remain clean. Which is also probably why they shut down large lists without much of a warning to you, and do other similar crazy stuff. I guess it works for them – and the other Aweber users, because when you send out an email through your Aweber list, it almost always gets there in your recipient’s inbox. Which is very cool. And which is why they also charge so much for their service. And that’s where DAP comes in. You can use DAP’s built-in email autoresponder and broadcast system, and send out emails through your web host. But that normally means that the deliverability of those emails is only as good as your web host’s deliverability. And if you’re not on a Virtual Private Server (VPS) or a Dedicated server, then relying on your cheap, shared web host to safely deliver your email to your members is totally unrealistic and naive – just ain’t gonna happen. And that’s where the 3rd-Party SMTP feature of DAP comes in real handy – this is one of the un-sung features of DAP that makes it so much more powerful than almost all other competing WordPress membership plugins, and just doesn’t get talked about enough. You can use DAP as an “Email-Sending Tool” and hook it up to an external SMTP service provider – like Amazon Simple Email Service (Amazon SES), Fusemail.com or AuthSMTP.com – to send out bulk-mail through DAP – while completely bypassing your web host’s email system. Which means you get high email delivery, thanks to a 3rd party SMTP provider like Amazon SES that practically guarantees you sky-high deliverability rates and rock-bottom rates, and you can host hundreds of thousands of emails in DAP for no charge other than standard hosting fees (it’s after all just disk-space in your database), and send emails through Amazon SES (costs just 10 cents for every 1,000 emails you send). Don’t wish to pay even those few pennies? Then simply use DAP on a decent web host like Liquid Web. DAP also has a built-in job queue to schedule outgoing emails, with the ability to throttle the number to make sure that you don’t exceed your web host’s hourly email sending limits (most web hosts limit you to 300 outgoing emails/hour). You can even use multiple SMTP servers from your own other lesser-used web sites, all combined together in a round-robin fashion, be able to send thousands of emails an hour right from your web host for absolutely free! So, to summarize, here’s what DAP can and can-not do when compared to more expensive, dedicated email services like Aweber and GetResponse. Aweber and similar services cost several hundred dollars a year (see Aweber.com – it could cost you about $794 a year – based on an annual fee of $194/year + another $600/year for maintaining a list size of just 5,000 subscribers). But all emails sent via DAP are essentially FREE! You don’t pay anything to send out thousands of emails and have a list with tens of thousands of members. The Autoresponder & Broadcast features are built right into the core DAP software. Don’t trust your web host to deliver the emails? Simply hook up DAP to an external email system like Amazon SES and send thousands of emails for mere pennies! Takes all of 5 minutes to set up! Full control over your list. You can make the sign-ups single opt-in. You can add your buyers to your list without forcing double opt-in on them. Services like Aweber will force double opt-in even when it’s a paid member who just purchased your product or service. And there’s no way around it. And you have to play by their rules, even if they don’t make sense sometimes. But since you control the DAP software, you get to decide who to send out broadcast or autoresponder emails to. Bring them all in as single-optin if you want. Or move them from one list to another. Or add them to multiple lists. Whatever you want. Ability to merge member data – like password or affiliate link or user id – right into the emails (DAP only). Third-party email services won’t know as much about your members as DAP does, and won’t be able to (say) send members their personalized affiliate link (like DAP can). International-friendly: Using DAP, you can send out autoresponder and broadcast emails in multiple languages. Not restricted to just English. DAP now supports Chinese, Spanish, Russian, Danish, French, Italian, and Hindi – and that’s just what we know! DAP will surely work with any language that is UTF-8 based. We don’t think any of the big third-party email marketing services – like Aweber or GetResponse – support non-English emails. This in itself is a HUGE plus for DAP. …into a support ticket with your web host, and ask them to confirm if they support all of the above. Please note that as a DAP user, you don’t have to know what any of this means. These are commonly available on almost all decent web hosts. Also, if your current host does not have any of these features, we’ve seen that most web hosts enable these for your web site by request, at no additional cost. So please check with your web host. If they can’t help, then here are a couple of recommended, DAP-Certified web hosts. DAP does not work on WordPress.com. You must install WordPress (downloaded from WordPress.org) on your own domain on your own web hosting account. Most web hosts have a 1-click option in their control panel (or cPanel) to install WordPress on your site. That’s the one DAP will work with. The web site that you get for free at WordPress.com, will not allow installation of 3rd party plugins like DAP. So you must have your own hosting account at a web host like liquid web. See our recommendations for web hosts. DAP works right out of the box, flawlessly, on all flavors of Unix/Linux. But when it comes to Windows servers, while DAP has been found to work on some installations, it all depends on the kind of Windows setup. We have spent way too much time troubleshooting Windows installations, so we do not recommend Windows-based servers. If you must use DAP on a Windows-based server, unfortunately, you’re on your own. We’re unable to support such installations.